There are only four pieces in Carroll Square Gallery’s “Pathways,” but each suggests a passage that stretches beyond the room. The three artists also use outlines and gestures in ways that suggest built (or buildable) forms. 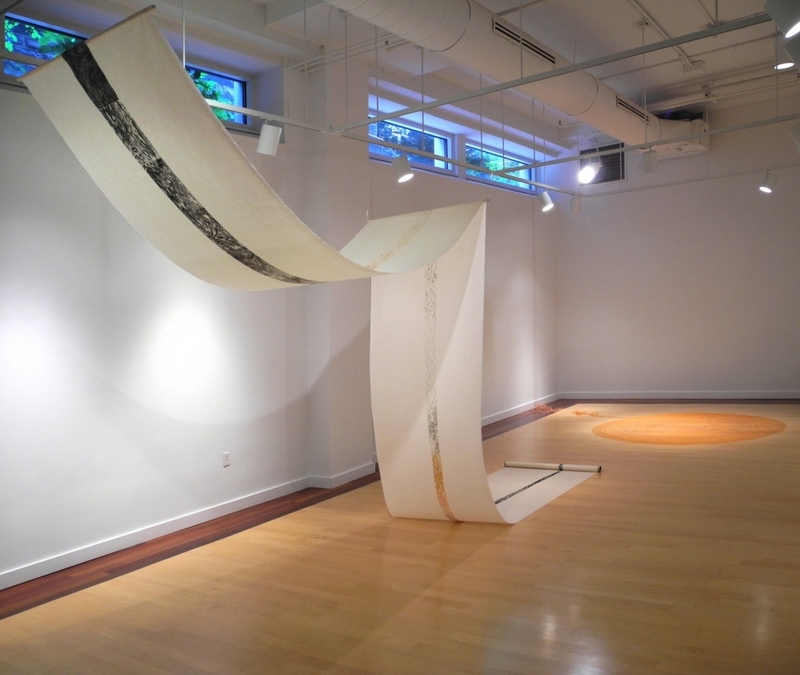 Anne Smith’s “Something to Nothing” is a 27-foot-long swoop of handmade Japanese paper that’s partly suspended in air and then dips to the floor. Along the wave is a strip of color, printed by wood block, whose color and width change. The effect is both monumental and ephemeral. Sarah Zuckerman Dolan’s “Lengsel” is a length of copper wire that also begins (or ends) on the floor. A thin metallic circle twists into a tangle and then climbs the wall, in a dance of order and chaos. A different sort of tumult informs Sarah Irvin’s pieces, made by using a squeegee to smear wet ink on nonabsorbent paper. The artist writes a word, and then obliterates it, leaving jagged smears that resemble sketches of architectural massing. What they actually represent is intellectual loss; each word is one that’s slipping from Irvin’s grandfather’s memory.